The Document Library page serves as a convenient store for documents and files that you might want to share with others, or provide for download by prospective customers, for instance - such as application forms, publicity leaflet, printable price lists, order forms, etc, and these can be in formats such as Word, Excel, and PDF. Your Spanglefish site’s admin system lets you upload these easily to your document library, and either have them download-able directly from it, or linked to from text links on other pages on your site. Click on the 'Manage Documents' tab on the control bar at the top of your site page. The Document Library page displays a two column file manager, with the folders in the Library on the left (if you have some) and a list of the files contained in the selected folder on the right . . . The Folder column shows the top-level Document Library folder, and any folders nested within it with the number of documents within each listed bedside the folder name. The right colum shows the files held within each folder in the document library. In the example illustrated here, the Meetings folder is selected in the left column, and the files within it are displayed in the right. 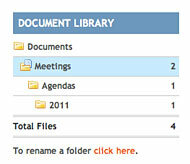 1) Select the folder where you want the file stored in the left column. If you want to create a sub-folder in which to store the file, click on the yellow 'Create Subfolder' button in the right panel, and give it an appropriate name. Then select the folder in the left column. 2) The right column now displays the contents of the selected folder. If this is a new folder, then it will be empty. Click on the the 'Upload File to this Folder' button. 3) Click on the 'Choose File' button and then navigate to where you have the desired file stored on your computer. Click 'Choose' to confirm. 4) The file will upload and be displayed in the file list in the right panel. NOTE: for the convenience of your users, and for speediest download, try to keep the documents uploaded to your library as small as you can - under 500k is a good guide. FREE users are restricted to a maximum of 30 stored files. Upgrade to GOLD to upload as many as you want. Now, learn how to link to a document so your users can download it . .